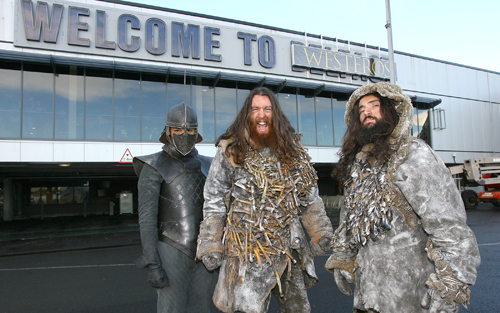 Over the festive season, hundreds-of-thousands of travellers heading to and from Northern Ireland will have to double-check their tickets, as Belfast International Airport is today being re-named as ‘Westeros Airport’. With 5.8 million people travelling through the airport each year, travellers during the month of December will now be greeted with a large scale ‘Welcome to Westeros’ sign on arrival. The momentous airport takeover will celebrate Northern Ireland’s involvement as a major filming location for the show and marks the Home Entertainment release of GAME OF THRONES SEASON 7 on Blu-ray and DVD in the UK and Ireland. 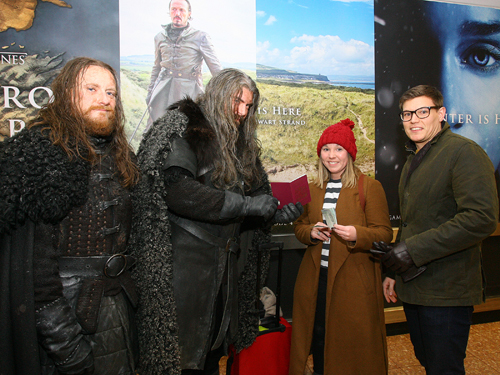 HBO Home Entertainment has collaborated with Belfast International Airport and Northern Ireland Screen to take over the airport and celebrate the region’s eight year, long-standing connection to the show. Production of HBO’s phenomenon GAME OF THRONES has been based in Belfast since the very first season, with the show filming in various locations across Northern Ireland including the Causeway Coast and Glens, north of the capital city, as well as south into Quoile and the Mourne Mountains in County Down. The story of GAME OF THRONES takes place on the continent of Westeros, in a large political entity known as the Seven Kingdoms. The airport being taken over and re-named as Westeros cements Belfast as the gateway for fans to all things GAME OF THRONES. Graham Keddie, managing director of Belfast International Airport, said, “We are delighted to partner with HBO UK and Northern Ireland Screen to showcase Northern Ireland as the home of GAME OF THRONES. As the principal airport for Northern Ireland, we look forward to welcoming the hundreds-of-thousands of passengers, as well as meeters and greeters that will be travelling through the terminal over the festive period and will be able to visit Westeros, right here, at Belfast International Airport. GAME OF THRONES SEASON 7 is available on Blu-ray, DVD and Digital Download now in the UK and Ireland.